What is the Best of Outdoors Event? Mini Olympics: we have picked our 6 most popular activities from running mats to the pony hop relay and the amoeba race. You will never laugh so hard again. Paparazzi: a photography based scavenger hunt utilising visual skills, creativity and time management. Fun and Games: comprised of a full group game and then competitive team games. Why our Best of Outdoors Event if fun? You will absolutely love our fast moving and challenging games that are unique and have been developed by us at Team Bonding. All of our games are inclusive, and we have catered to all tastes from fitness level through to game types. You will find our games encourage your teams to be inclusive, full of team spirit and will support each other to get the challenge or game completed. Along the way, you will need to balance your creative skills along with competition, problem solving and time management. Where can our Best of Outdoors event be run? To run this event type we need a spacious flat area. For your comfort, we also need toilet and vehicle access too. In the warmer months too as it can heat up so much shade is also a preference for your own safety and comfort. A location that works well for our Best of Outdoors events is the Botanic Gardens – Tarpeian Way (off Macquarie St). It’s a great spot for this event and to make things easier for you too we can arrange permits on your behalf. If you have another park in mind then let us know but do keep in mind that from our experience Council permission is generally required for all parks, and permit fees are required. 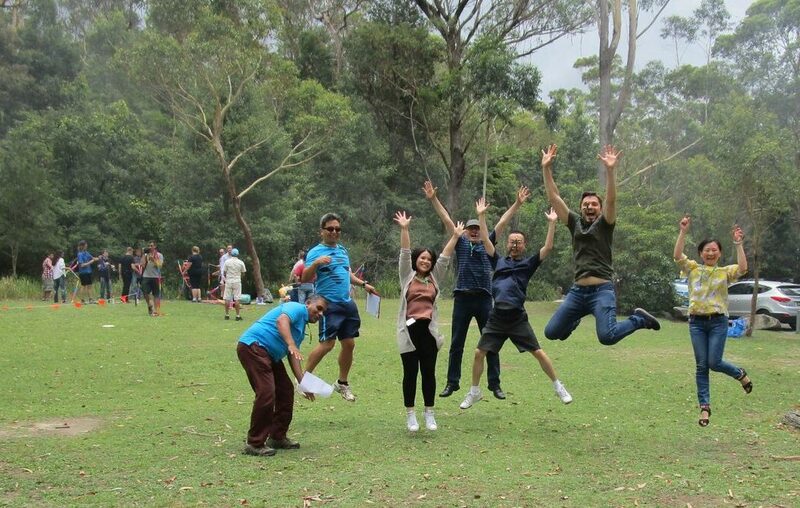 The photo of the team above was taken in Lane Cove National Park and many councils have suitable parks or ovals for this event.